The below workshops and opportunities are displayed on behalf of other organisers, and are not always associated*, or the responsibility of, the Greenwich School Sports Partnership. Inspired Through Sport is a government backed initiative to help tackle obesity and get children more active. They have teamed up with a host of GB athletes to inspire schools and highlight the importance of a Growth Mindset to children across the U.K for free. Currently taking bookings for September and October 2018, you can visit their website to meet some of their gold medal winning athletes just back from the Commonwealth games! For more information, please see the ITS Services document at the bottom of the page. DSActive is a sports programme for people with Down’s syndrome administered by the Down’s Syndrome Association (DSA). DSActive currently have over 40 football sessions and 20 tennis programmes that run over England and Wales. All of the programmes are easily accessible and cater for ALL ages and ability. 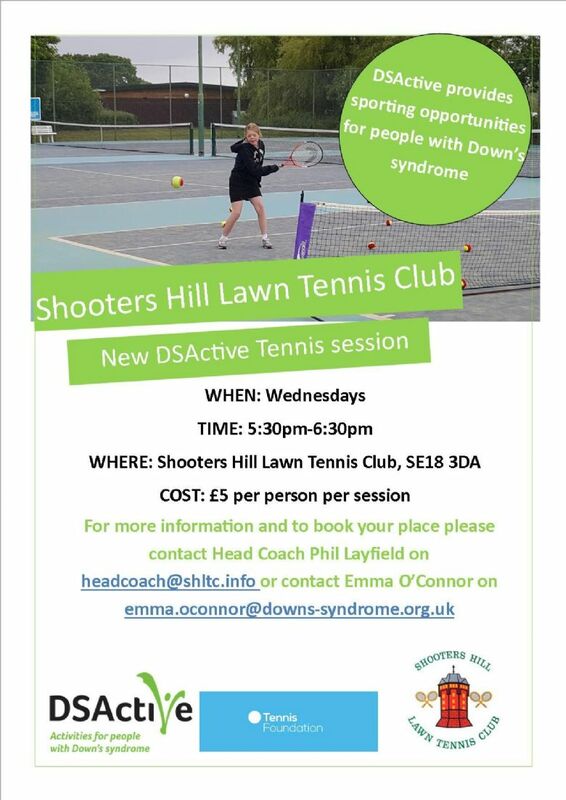 DSActive are running DSActive Tennis sessions at Shooter Hill Tennis Club. This unique after school and holiday programme is based around Track and Field athletics. It's an excellent opportunity for boys and girls to mentally and physically challenge themselves; developing speed, strength, and stamina whilst working with a range of Olympic and Paralympic athletes over 1 to 5 days. (This can run in the summer holidays or as an after-school club before the school breaks up). The academy would allow students to participate in 10 different athletics events, alongside classroom based, educational sports lessons. The academies would be run by Team GB athletes, who are very experienced and hugely enthusiastic. These athlete role models offer nothing but encouragement and help to create a competitive learning environment for children, where they will make friends, have fun, and be truly inspired. If they can get 100 Children on the camp they will give 20% of the profits back to the school! The Lord’s Taverners run both table cricket and Super 1s in the Greenwich area. These two programmes are both focused on engaging young disabled people in cricket and are delivered by Kent County Cricket Board. For more information on how your school can get involved, contact head of cricket programmes, Henry. FFFK have set up a kids fitness program based on fire fighting/fire safety and a range of other situations that firefighter face. The programme is designed to get kids active in a fun inspiring way and promote positive role models whilst battling the alarming rate of childhood inactivity. Recently, they have made 20 online workouts that cover a range of themes that include nutrition, hydration and wellbeing. School Swimathon is a swimming programme for primary school children, aimed at increasing swimming activity and supporting Swim England’s vision that every child should learn to swim before they leave primary school. Now in its seventh year, the programme is designed to sit alongside national curriculum swimming lessons and encourage children to swim their best. Taking place throughout the 2019 Spring Term, pupils take on an initial challenge in January and then use their weekly national curriculum swim lessons to improve their swim distance. Pupils will then try to swim further than ever before, in a final challenge at the end of the Spring Term! Registration and access to online resources is free, including certificates to download and present to your pupils. There is a small £20 delivery fee for optional School Swimathon materials, including wall charts, limited edition swim caps and embroidered achievement badges. If you would like your school to get involved, please sign up below. 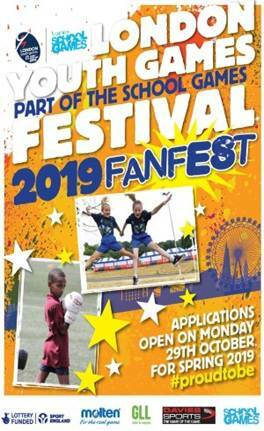 LYG will be hosting Fanfest again this Spring, it is a chance for children in Year 3 - Year 6 to get involved in a variety of sports and cultural activities! Applications for Fanfest have now opened! *Workshops and other training opportunities that are hosted and related to the GSSP will be clearly indicated. Opportunities that are not listed as GSSP are not conducted by the Greenwich School Sports Partnership, and the Partnership holds no accountability for these events.